If you do a search for digital paper you will find an enormous array of choices. Many of these have one thing in common. They are of a graphic style with a computer generated look. This is not a bad thing it just doesn't look very painterly when used as a background for your creations. Hand painted digital papers like those found here lend an artful touch to stamping, collage, mixed media and painting projects. The question is "how shall we use them?" Printable papers can be used as a quick base layer for a painting or a wonderfully complex-looking background for stamping or collage. 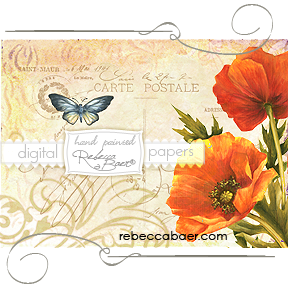 The example above showcases one of the papers from my "Painterly Backgrounds | Whisper" collection used as a base for hand painted poppies and a butterfly. The underlying text was added electronically prior to printing. To do this use an inkjet printer to print the desired background on 140# watercolor paper. I prefer Arches professional grade papers in either hot press (smooth) or cold press (lightly textured). I use an Epson all-in-one photo printer similar to this one and only use genuine Epson inks. If you are using a different brand printer or ink your results may vary. Allow the ink to dry overnight then use a dense foam roller to apply a single coat of multi purpose sealer. This will prevent the ink from bleeding when you paint over the background. If you want to be able to manipulate the background by adding water marks do this prior to sealing. The printed papers can be dry mounted on a firm substrate using our Gilded Stenciling Adhesive. To do this coat either or both the back of the paper and the firm surface with the adhesive. Allow the adhesive on both surfaces to dry and then press together. Using this method will not warp heavyweight paper like 140# watercolor paper. The paper can be flexed in one direction without causing wrinkles meaning it can be mounted onto a cylinder, like a curved box. Fanciful cards, tags, or other paper crafts can be created using the backgrounds alone or with either digital or rubber stamps or a small hand painted accent. For this, the backgrounds can be printed on white or tinted card stock (using tinted card stock will shift the hue) and cut into the desired shape. Simply stamp a design leaving room to write your greeting as well. Of course, the background could be incorporated as a layer on a more complicated work. The cards shown at right use digital papers printed on Canson 140# cold press watercolor paper. They are accented with hemp twine and a simple embossed sentiment taking only minutes to create. Print the paper then print a box, bag or other template on the reverse side. Since the paper is flat it can be further decorated before you cut and assemble the template. You can also use dies and commercial cutters to cut out shapes from the digital papers. Use the digital papers for creating 3D flowers to accent your work. Depending on what you are making you may want to print both sides. You can download templates for these from various websites or use punches and layer the shapes to create dimensional flowers. Consider using two coordinating papers for contrast. You can use these on cards, in mixed media work or instead of a bow on a gift for someone special. Try glittering the edges and using a button or bead for the center. Print on super light-weight paper* to created crinkled and fluffed flowers. For very light weight papers you may need to attach a more substantial paper in order to feed through your printer. I typically use a brush of rubber cement to bond the leading edge to a piece of card stock. *Disclaimer: I make no guarantees regarding the wisdom of running random things through your printer. Use your best judgement and risk assessment before attempting to try any ideas presented. I have an older printer that I run things through as a test to see if they jam up before I try it on my preferred printer. If I break the old printer it is no loss. 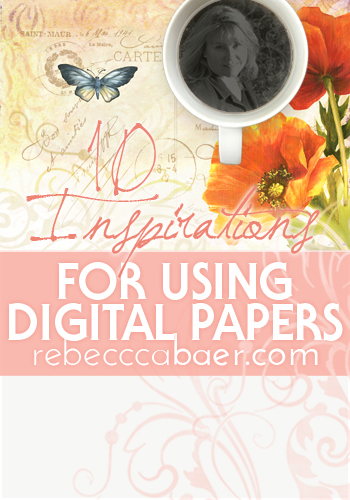 Instead of using plain paper or card stock, print the digital papers on old book pages. Consider the text and perhaps use something relative to the art you wish to create. Sheet music would also make a wonderful base paper. Print the digital papers onto Christmas Carols then stamp with an embossed silhouette or greeting for unique Christmas card. You can use the overprinted text/music as backgrounds for painting or other art or use the printed pages for the 3D flowers mentioned above. 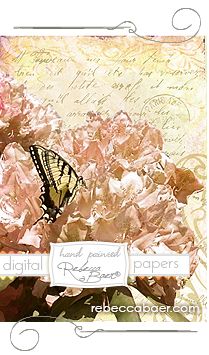 Digital papers can be used to add a painterly backdrop for quilling or embroidery . Print on cold press watercolor paper for a light texture. Then mount your quilled paper creations on the paper before framing. If stitchery is your muse, here's a book for Embroidery on Paper. Digital or real world Scrapbooking! Wouldn't your photos look wonderful surrounded by these painterly papers? You could use the coordinating papers in a collection to create a "patchwork" page on which to mount your photos. Or start with a plain page and mount each photo on an individual, painterly background. Document your travels with the digital papers printed on the maps where your photos were taken. There are many public domain maps online. Search for "public domain maps" and you will find maps of varying ages available for free. Imagine your floral photos isolated over a textured background; with a PS blending mode thrown in, the images sing! The image at right depicts a butterfly visiting a vibrant pink rhododendron. In the original photograph the color of the flower overpowered the butterfly. When layered (over and under the floral image) with two copies of the same background, from our "Painterly Backgrounds | Whisper" collection, the image becomes unified and the butterfly becomes the focus. The background layer that is overlying the photo has the "hue" blending mode applied. Opacity is 100%. For the artist who uses paint as their primary medium a softened floral image like this could be used as a background with a butterfly hand painted over the digital image. For a card maker this needs nothing more than a greeting or sentiment whether stamped, printed or hand written. Ink transfers are a great way to apply the digital imagery directly to wood or other porous substrate without any paper remaining on the surface. To do this, mount the freezer paper onto a piece of card stock so that is does not curl and provides a bit of body for passing through the printer. * The easiest method for bonding the paper and card stock is to use a spray adhesive. Be sure to do this in a well ventilated area (I prefer outside) and protect the surrounding area from overspray. Use a piece of freezer paper larger than the card stock Lightly spray the card stock and smooth the matte side of the freezer paper onto the adhesive. Trim away the excess freezer paper. Lightly dampen (not too wet) the surface on which you want to transfer the image with multi-purpose sealer + water 1:1. Use an inkjet printer to print the the digital paper on the shiny side of freezer paper. Immediately place face down on the wood surface and burnish to make sure all parts of the image come in contact with the surface. Any porous surface can be used. Using this ink transfer method on fabric would make a wonderful background for embroidery. Transfer directly to stretched canvas for a quick start to a painting or collage. You create a secret treasure box from an old canvas-bound book by using RB gel to bond the pages. With the pages together, apply the gel long the three outer sides. When dry, cut out the center of the pages. Apply gel to the interior cut edges as well. Then bond the back cover to the pages with the gel. Decorate the front cover (lid) starting with an ink transfer then add additional decoration as desired. This will work best on a light-colored book or apply a coat of light color paint to the cover before doing the transfer. Save the transfer sheet. Wipe to remove any residual ink and you can reuse it indefinitely. 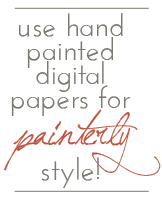 Shop for painterly digital papers here!